Welcome to Week THREE of the 30×30 Challenge in November. I must say… I am a little ahead on taking the photos, so I am really on Week Four (of Five) with 10 Days left to the challenge. I will admit, I am ready to be done! This is a fun challenge, but… ohhhh, I miss the other clothes in my closet. 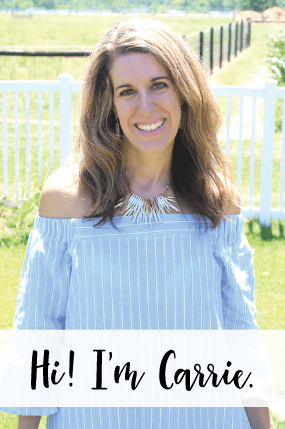 Especially since I just bought an awesome houndstooth blouse from my Stitch Fix Box this month, take a look at it here. I miss going out the door in the morning for work WITHOUT having to stand out in the cold while Brian snaps my photos. I miss being able to dress like a complete slob on the weekends or in boring greys/blacks for work. BUT, the plus side?????? I have come up with some really, really cute outfits you guys! I really loved some of the outfits I came up with this week. Day Thirteen, Day Fifteen, Day Sixteen, Day Seventeen AND Day Eighteen I LOVE, LOVE, LOVE! I have never been in love (times three!) with so many outfits in one week ever in this challenge! So, I would say this week was a TOTAL SUCCESS. Yeah!!! Did I mention that I will finish this challenge on THANKSGIVING? Yep! I already have the rest of my outfits planned out and I am loving what I have planned for Thanksgiving. Also, next week I have a LITTLE surprise for you! Stay tuned! Have fun browsing through my outfits… be sure to let me know if there are any that you really like… have a good week! Day Thirteen is my absolute favorite outfit so far! I LOVE it. I saw this mustard colored coord skirt at the Banana Republic Outlet and had to have it! I love purple with gold, so I paired it with a purple sweater with chambray button down underneath (of course). 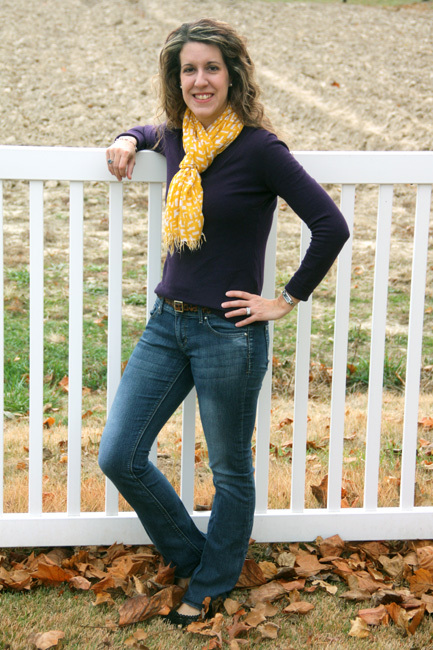 Then, I tucked a mustard colored necklace from Molly Suzanne inside the collar of the chambray shirt so that just part of it was peaking out. 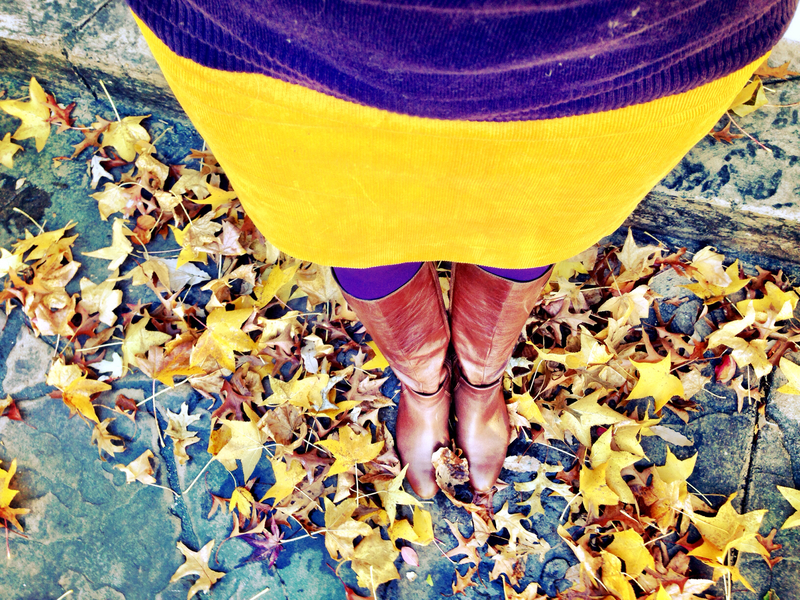 I finally got to wear my new purple tights from Target- I must say… colored tights are so much f.u.n.! I was going to wear my black boots, but you’ll see from the square photo I posted on Instagram, I LOVE the outfit with the brown boots. If you don’t already follow me on Instagram, follow me by clicking here! 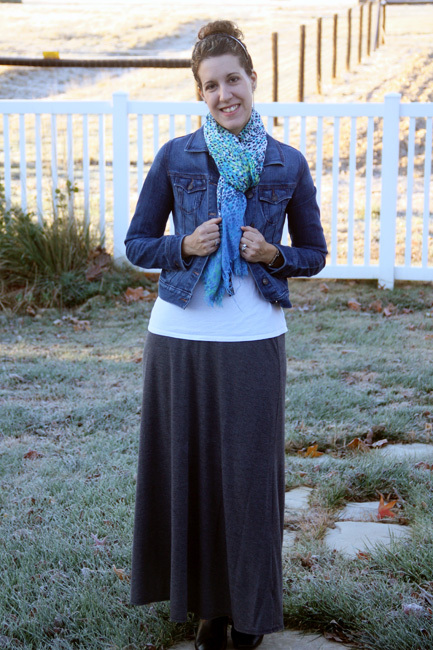 On Day 14, I wore a grey maxi from ON with an ON jean jacket. Paired it with a cute animal print (in funky colors) scarf with black boots. Super comfy outfit! 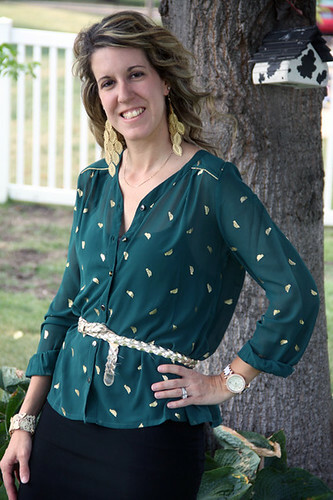 On Day 15 I wore my favorite piece, the dark green Stitch Fix top with a gold belt, a black skirt from Express that ruffles out on the bottom and brown boots. I love this outfit! I actually didn’t recreate it for the 30×30 Challenge, because I posted it here for my first Stitch Fix box post. 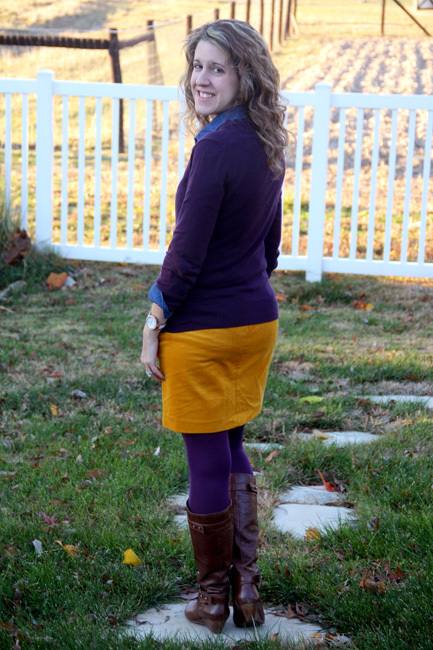 I really enjoyed this outfit from Day Sixteen and it was an outfit I thought up that morning! 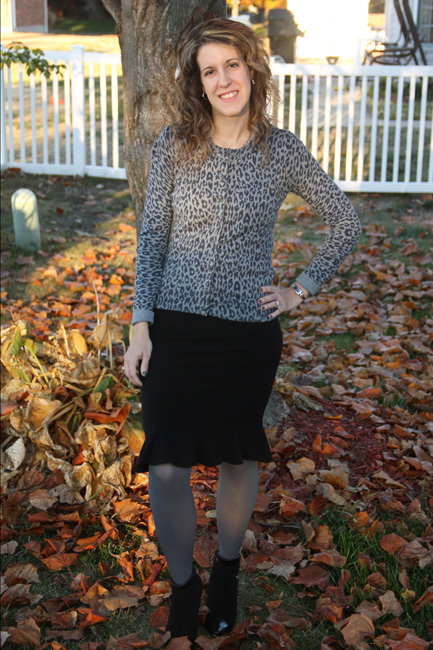 Since there was a little grey in the animal print cardi, I decided to wear grey tights. I was going to wear my knee high black boots, but thought my cute patent leather tipped booties from TJ Maxx would look even cuter with this skirt from Express. I must say, I did have a good chuckle when I took the booties off tonight after work… the price tag was on the bottom of one boot and a big green sticker with my shoe size on the other boot! LOL! I have seen people walking around with price tags on the bottom of their shoes before and I always think to myself, how tacky… lol! But, I did it myself today so I can no longer say that! I guess that is what happens when you buy from TJ Maxx! ha! 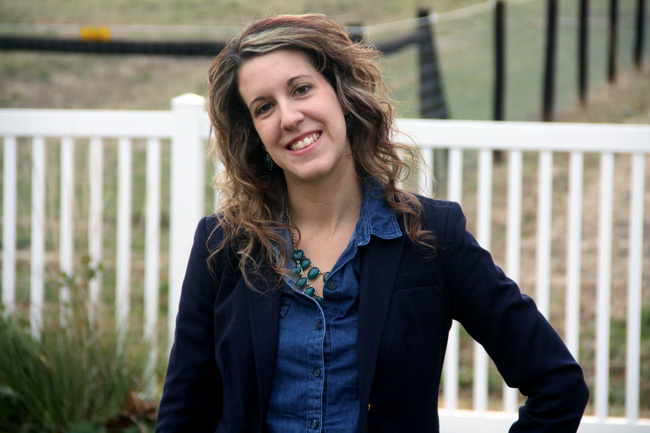 I really loved my outfit that I wore on Day Seventeen… as you’ve probably seen, a lot of my Fall 30×30 items are green and navy. This is the first time I’ve worn the blazer during this challenge and I love how it looks with the chambray shirt, green skinnies and brown boots. It was a great outfit to wear to work for Friday when we can wear jeans. 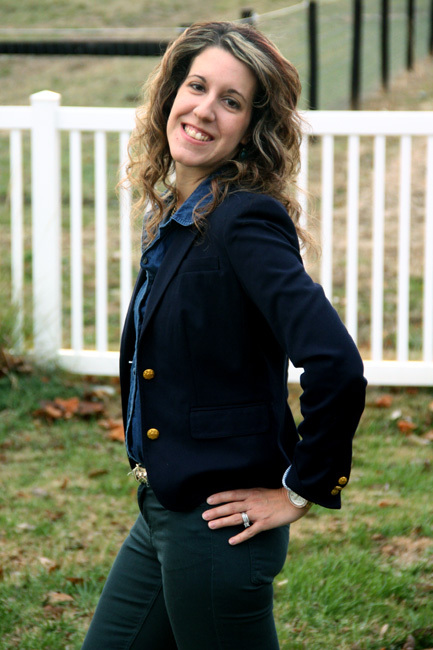 This blazer is actually a size 2 and I found it on sale at Banana Republic Outlet… I normally wear a size 4, but they were out of the size 4 and the size 2 fit amazingly well. This was the day of Autumn’s birthday party at Sweet N Sassy, so I wanted to wear something nice, but I also wanted to be comfortable. 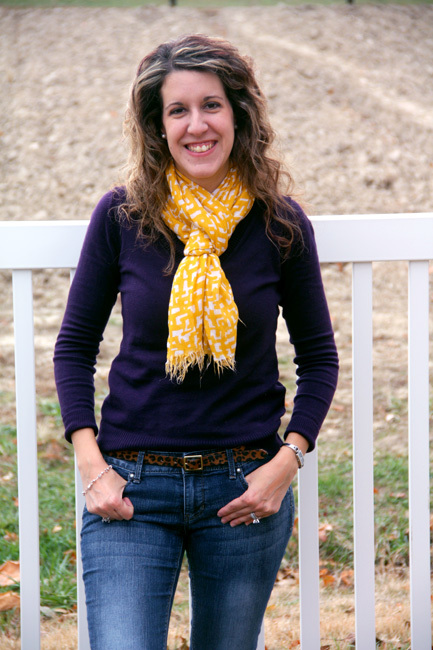 I put this purple sweater on and it looked a little boring with just jeans, so I added a yellow patterned scarf and I really liked the result. Then, I added a leopard print belt to mix and match the pattern on the scarf and it all paired nicely together. Hope you enjoyed this weeks outfits! Be sure to check out the other bloggers outfits from this week as well!